Peter Bryer: Mobile Foresight: Is the future of smartphones so transparent? This see-thru smartphone display could enable something new. Is the future of smartphones so transparent? This see-thru smartphone display could enable something new. Is the future form factor of smartphones so clear? Transparent displays have been around for a while. I remember getting a look at LG's "Crystal" handset about four years ago. It was stunning, perhaps the best-looking handset I've ever seen. It didn't do much else than look sharp, but that's a great start in life. So, will clear be the new hot thing someday in smartphones? A Taiwanese maker of glass products called Polytron Technologies is shopping around an early version of their clear smartphone display. 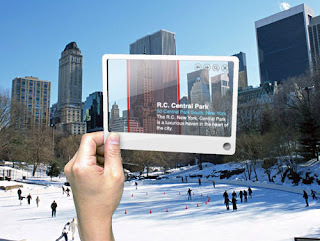 Such transparent displays could go beyond just creating good-looking devices: for years, visionary augmented reality use cases have been calling for such technology. Does this glass provide a window of opportunity for some smartphone maker to bring a new form-factor to market? Maybe. Such things are not always easy to see.